Survey Audit and quality control is the process of making sure the surface positions and heights of RTK points match up to the subsurface seismic data gathered through seismic processing flows. Survey audit calls for a detailed examination of the survey data (current or legacy data) in terms of all of its geodetic properties and ensures that coordinates and elevations are correct prior to seismic processing. In the instance where data is being acquired and you know its origin, survey audit is the measure twice cut once way of thinking. Think of it as cheap insurance for your seismic projects, not unlike health or car insurance - it's there in case you get sick, or get in a car wreck. Survey audit acts as the insurance that's there for the instances where there were errors in the original survey, incorrect datum conversions, or incorrectly applied horizontal and vertical datum conversions; the types of error that can occur even with GPS are numerous. We hear often "But its GPS, the data must be correct." Wrong! The common mentality is that because GPS is used, the results are completely accurate. But GPS is only as good as the operator. It doesn't matter how safe the car is that you're driving, if the driver isn't paying attention to detail on the road, the technology of the car is subject to human error. GPS is no different, and we have found that having our services act as a last line of defense ensures data integrity and improves seismic processing flows, and confirms your data is accurate on your workstation. Further to that, data changes hands countless times in our business. Do you know where your data comes from? How it was acquired? When it was acquired? By whom it was acquired? Whether it is mergers and acquisitions, purchased data, or legacy data, the reliability of the original field data collected is often in question, and moreover, often incomplete. 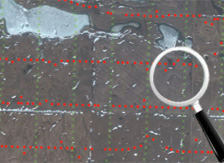 However, that original field data is the basis for which all other processes flow, so if there are inaccuracies or if the data is incomplete, often seismic processers are left having to extrapolate, interpolate, and do what they can to make sure the data is as relatively accurate as it can be, based on what they are given to work with. Survey audit is just like it sounds, it's a detailed process that analyzes and examines original field data from every angle to ensure that once it's handed off to the seismic processor they can work with a data set that is complete and accurate. It eliminates the guessing game and it's there as your insurance policy to mitigate the potentially costly consequences of human or environmental errors in the field. Furthermore, survey audit ensures you get what you paid for and that all the field data has been properly submitted and is available for investigation down the road, or that the data is complete for sale or trade. This is best done at the time the survey is acquired so missing data issues can be corrected prior to the seismic contractor moving onto the next project. Their work may be done, but your work is just beginning for data processing and interpretation, and you want to be sure the data you are working with is precise and complete. When we are dealing with potential million dollar wells, do we want to just take our best guess? Or do we want to ensure that we are making our decisions on data that is not just relatively accurate, but absolutely accurate, and that what we see on our workstations is truly spatially correct on the ground? For less than 1% of the project cost, survey audit is the process that makes sure that's the case. Some of the largest oil companies worldwide have made survey audit a small but important step in their process of doing business. With the kind of investments they make in exploration, they understand the importance of having their data accurate and complete regardless of where the data originates. We don't drive cars without car insurance, we shouldn't go without health insurance, and at the end of the day, for your seismic projects, you shouldn't go without the insurance of survey audit to be there as a last line of defense for data integrity. I have been surprised by the number and magnitude of well location errors found by SANTOS on both our domestic and international 3D survey projects. Survey issues cascade their way through the processing flow, resulting in a degraded final product.